Snow can cause a huge problem for motorist, pedestrians and for your business but with an effective snow-plough and Land Rover, Chain Reaction Yorkshire Ltd can help to clear anywhere. School and doctors surgeries are among the many that ring up for help in the snowy season to make sure that the path is always clear to their front door. As well as clearing Chain Reaction Yorkshire Ltd grit pathways to ensure that their customers have safe and easy access to their property and a reduced slip risk in the colder months. 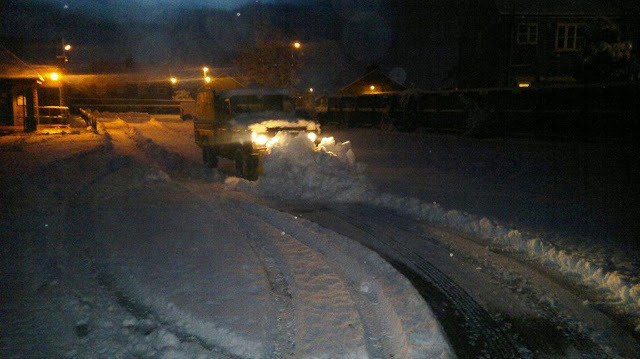 Chain Reaction Yorkshire Ltd's large Land Rover snow-plough makes short work of clearing any snowed in area. It is able to get into the much smaller areas which ordinary snow-plough can’t, whilst still being able to cover big areas at the very same speed. What ever your requirements Chain Reaction Yorkshire Ltd are sure to have a solution. To help prevent accidents on those difficult and often dangerous surfaces let Chain Reaction Yorkshire Ltd help to ensure your safety this winter.